Presentation A 10% suspension of Fenbendazole as a ready to administer oral anthelmintic for horses. 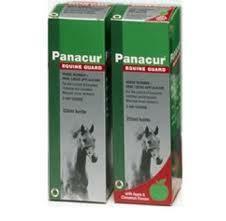 1ml Panacur Equine Guard contains 100mg active ingredient Fenbendazole. Uses For the treatment and control of adult and immature roundworms of the gastro-intestinal tract in horses and other equines. Panacur Equine Guard is effective for the treatment and control of encysted mucosal 3rd and 4th stage small strongyle larvae and is also effective against encysted inhibited 3rd stage small strongyle larvae in the mucosa. Panacur Equine Guard is also effective in controlling other immature and mature roundworms including large redworm (Strongylus edentatus and Strongylus vulgaris) and migrating large redworm, Ascarids (Parascaris equorum), Oxyuris and Strongyloides species and benzimidazole susceptible adult and immature small strongyles. Panacur Equine Guard also has an ovicidal effect on nematode eggs.